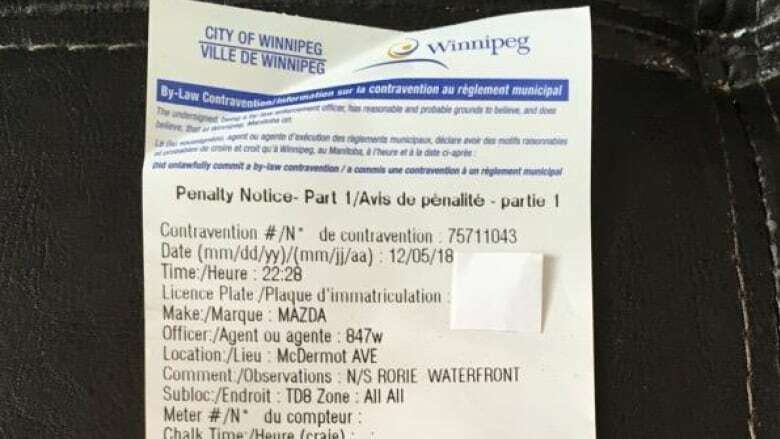 Many people received a nasty surprise in Winnipeg's Exchange District Wednesday evening when their cars were ticketed and towed. Many people received a nasty surprise in Winnipeg's Exchange District Wednesday evening when their cars were ticketed and towed — and while the city says signs were posted, some people who were in the Exchange that night say they saw no such thing. It happened during a busy night in the entertainment district, when the streets were lined with parked cars. "There were at least a dozen tow trucks towing away every car in front of our theatre and all the way down Rupert," said Chris Brett, who works at the Royal Manitoba Theatre Centre's Tom Hendry Warehouse on Lily Street and Rupert Avenue, near the Centennial Concert Hall and the Manitoba Museum. He was taking a break from rehearsals around 9 p.m. when he saw the flashing lights from the army of tow trucks hauling cars away. "What went through my mind was, 'Why are they towing all these cars?' You know, the city, they're begging for people to come downtown and this is how they treat them," he said. When the trucks were taking the cars, Brett noticed some temporary "No Parking" signs and street work signs had been posted, "but none of those signs were out there at dinner time" when people first arrived, he said. "I can't think of anything other than this is discouraging people from coming downtown," Brett said. "These are hardworking folks, and I'm thinking probably lots of retired folks coming out to see their one show of the season, then coming out to find their car is towed. "Now their next step is paying $150 worth of tickets and taking a cab down to Higgins Avenue in the middle of the night to pick up their impounded car." The temperature had dropped to about –19 C with a wind chill that made it feel more like –27, Environment Canada data says. 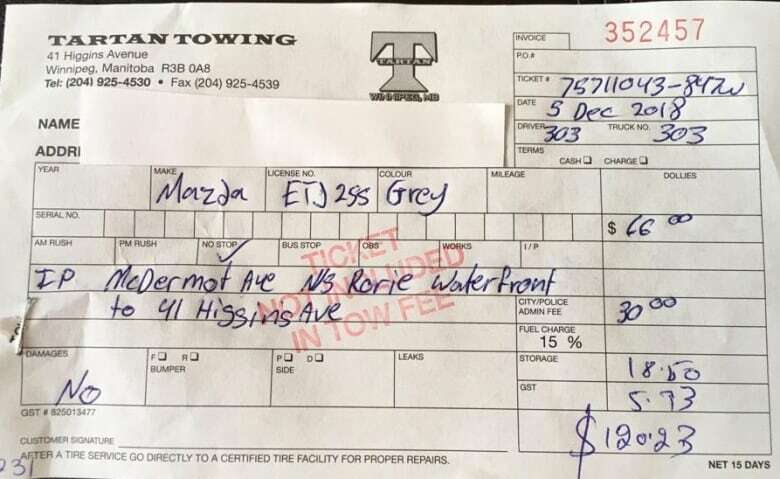 On top of the $150 ticket and cab costs, people would have had to pay another $120.23 for the tow and impound charges. In a statement Thursday afternoon, a city spokesperson said signs had been posted at least 24 hours in advance. Kalen Qually said after snowfall on Nov. 28 and 29, city crews headed out on Dec. 2 to clear piles of snow left behind on boulevards and curbs. "To accommodate the hauling operation, city crews posted temporary no parking signs in the area of Lily Street and Rupert Avenue on Tuesday afternoon. These signs remained in place on Wednesday night, when crews began working," he said. Qually reminded people to look for temporary signs before parking. Jaime Carrasco, who left his car on McDermot Avenue for a band rehearsal and came out later to discover it gone, said he didn't see any signs prohibiting parking. "It was a shock. It's not the best thing to happen right before Christmas," he said. When he went to get his car back, the impound lot was busy with people "and most of them were elderly folks," said Carrasco, who didn't talk to any of them about how they felt. "It was just so cold. I just wanted to get in the car and drive home, but there was one elderly man in particular who was on crutches and didn't seem too happy to have to deal with that." Carrasco's parking ticket notes temporary traffic control for street works from 8 p.m. until 6 a.m., but there was no warning, he said. "If I had seen signs I wouldn't have parked, and if I didn't see anyone else parked … I would have known something was up," he said. "But there were at least another dozen cars there."